"Fast and Easy Data from Trip Advisor!" Trip Advisor has established themselves as the go to source for travel information. 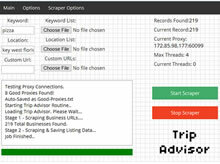 Now with the Trip Advisor Scraper by Local Scraper you now use this information for your own Lead Generation. 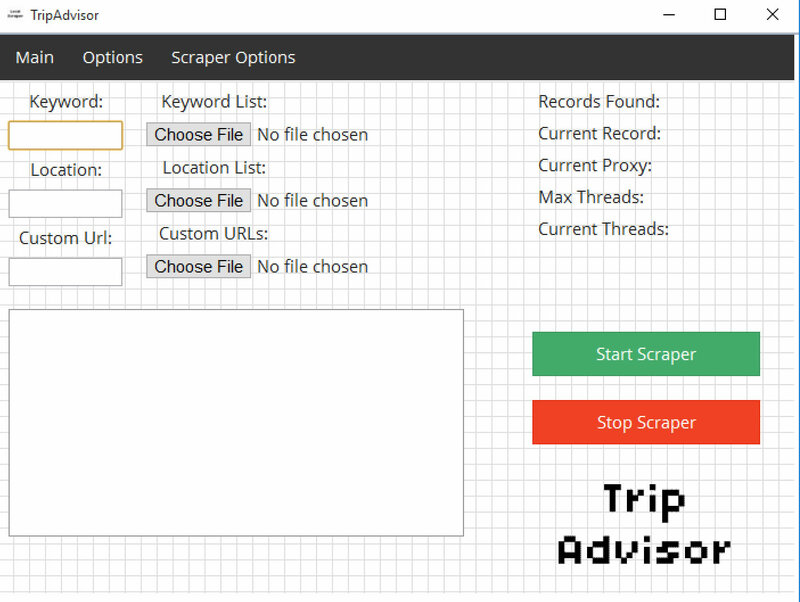 Based off of 6 successful years in the scraping industry our Trip Advisor Scraper is just as reliable and easy to use as all of our existing products. With the simple touch of a button you personal scraping robot will being to gather valuable lead information. This scraper gathers 22 separate fields of information from each listing. Business details such as address, phone numbers, emails, websites, social accounts (Facebook, Twitter, and GooglePlus), and much much more. Watch as the program visits each page auto scrapping the valuable information your after. 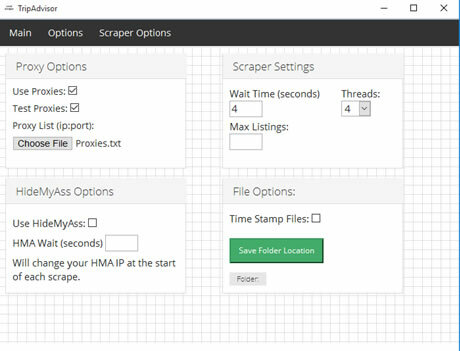 With up to 15 threads and proxy support you will be scraping leads faster than ever before. 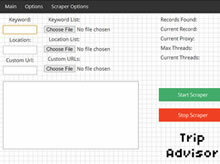 You could have hundreds of results saved into a csv file in a matter of minutes. This data can then be imported into any SQL database or any CRM system. You stay in control over the whole process the entire time. Take a look below at some of the details you could have access to with Trip Advisor Scraper. 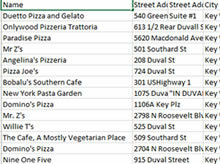 There is even a sample csv file you can download to see the results your self. Scrape more data even faster with multithreading support. 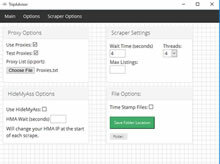 Use up to 15 threads for super fast scraping of data. Wanna see some sample data? 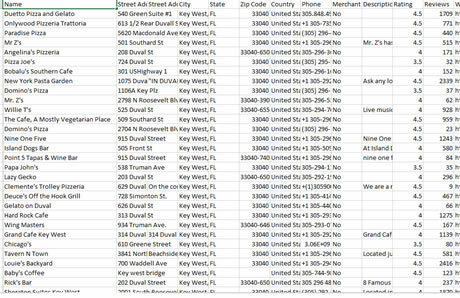 Below is a quick scrape of 200+ results with basic options. To get even more data you can enable "Scrape Website" our custom system to visit a business website and return even more information. Download a sample CSV File! The payment option below is for a single license of the Trip Advisor Scraper. Your order is a 6 month subscription and insures you always have the latest and greatest version of our Trip Advisor Scraper. 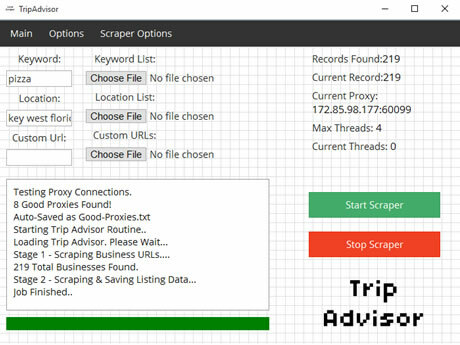 Get instant access to Trip Advisor Scraper for only $39.99! * Trip Advisor Scraper only supports Windows OS. ** Your purchase is for a Single License of Trip Advisor Scraper. Your Single License allows you to install the program on two computers.